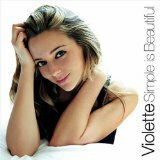 Sorbonne and Berklee College of Music graduate Violette harnesses a complex range of influences on her third album, which give the lie to its title Simple is Beautiful. Sometimes the mix is so broad that it’s tricky to pin down a specific style or direction: “All I Need”, for example, juggles rhythms and pace like there’s no tomorrow. That’s no bad thing in an age when the music industry seems more determined than ever to categorise artists in easy-to-market boxes. Here are power ballads, soul shuffles with a hint of reggae and, for good measure, a dash of Piaf. The award-winning singer /songwriter’s jazz-tinged pop songs, mostly self-penned (with Rich Mendelsson), are deceptively light, and underpinned by catchy beats, urgent guitar riffs and earthy harmonicas. Quirky references and rhyming couplets abound on numbers like “Superwoman”, interspersed with reflections on the contemporary life and concerns of a young woman about town. Violette has a sweet voice that reflects the discipline of her classical training – thankfully, the modern trend for all things melismatic has passed her by – and is particularly suited to ballads such as the title song and the bonus track “Miss Your Company”, if a little less robust on the up tempo rock and gospel numbers. There’s a glorious Streisand-style torch song, “Don’t Make Me Beg”, all soaring strings and building key changes, which might have considerably improved France’s recent Eurovision status, if Violette had been tempted to represent her native country. She lives in New York these days, but there’s a nod to her roots with a couple of French language tracks: “Insomnie”, a swirling love song with an operatic choral backing, and “La Vie en Rose”, a jazz-flecked interpretation of Piaf’s standard that is more Manhattan supper club than Montmartre bal musette, reflecting Violette’s transatlantic transition. Between them she and Mendelsson have produced another album with great clarity. A fourth is already on the way.